1. Preheat the oven to 190˚C, Gas Mark 5. 2. Scrub the carrots clean and trim off the tops, then place them in a large roasting tin. Add the oil, garlic, lemon juice, a third of the tarragon and plenty of salt and freshly ground black pepper, toss well to mix. 3. Mix the butter with the lemon zest, remaining tarragon and some more black pepper. Divide the butter into four portions; use your fingers to push each quarter under the skin of a chicken breast fillet. 4. 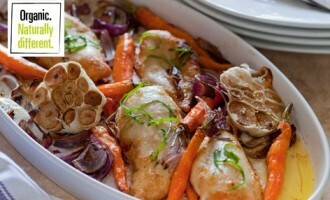 Lay the chicken breasts skin-side up on top of the carrots and bake for 25–30 minutes until the carrots are lightly charred and the chicken is golden and cooked through, with no pink showing. Serve with green vegetables and new potatoes.